Skip the crowds this year and discover where the true deals are, online! Five exclusive HEXBUG toy deals are guaranteed to help you bring home more bang for your buck. These Black Friday deals won’t last for long, so snag them while you can! There has never been a better time to start building your HEXBUG collection! This bundle is perfect if you have never owned a HEXBUG toy, or if you want to take your toy box to the next level. You can build, battle, or be adventurous. With so many different toy lines, there’s something for everyone! Make a splash this Black Friday with the AquaBot Insanity bundle! Whether it’s in a fish tank, bathtub, or even the kitchen sink, have fun watching your AquaBots swim around. With this set, you get both autonomous and remote control AquaBots, so whether you control your fish, or turn them on and let them go, your aquatic adventure awaits! STEM-ulating Deals! HEXBUG VEX Robotics Super Builder’s Bundle! Expand your imagination, and challenge yourself to build some of the coolest toys on the market. These four VEX Robotics kits offer a great value for those who want to develop basic engineering skills. With both physics based launchers and motorized contraptions, this bundle will put your STEM skills to the test. Powered by vibration technology, these motorized bugs are fun to let loose and watch where they go. The V2 and nano Nitro can crawl vertically through the tube tracks, giving them access to all kinds of new areas. If climbing wasn’t enough, they have even traveled to outer space! 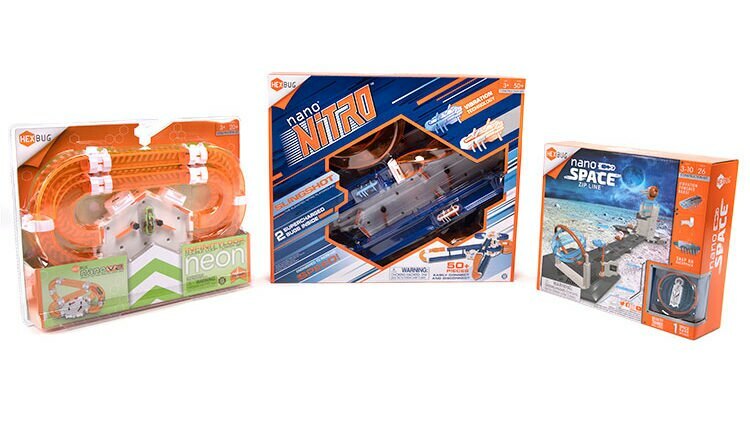 Take a ride on the zip line with the nano Space Zip Line play set. Are you a BattleBots pro? Do you have what it takes to build your own bot, and fight against seasoned champions like Tombstone and Minotaur? With this bundle, put your skills to the test and see if you have what it takes to demolish the competition and win the BattleBots championship! Happy Hunting! If you’re looking for more Holiday gift ideas, check out our video Gift Guide for all of the details on our hottest toys this season!